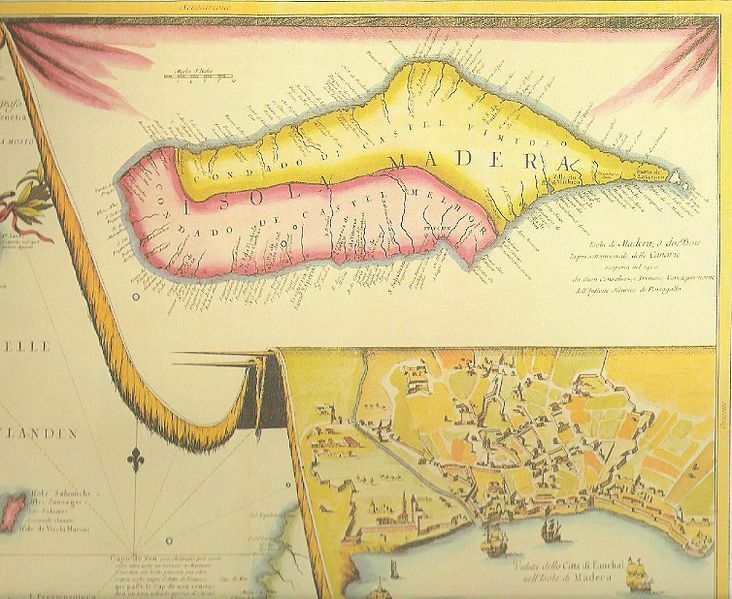 Section of map of the Canary Islands and Madeira, by Vincenzo Coronelli, 1692, courtesy of Internet Culturale: Cataloghi e Collezioni Digitali Delle Biblioteche Italiane. Madeira featured early examples of sugar plantations owned by Europeans and worked by enslaved African laborers. This cash crop agriculture and enslaved labor model would eventually spread throughout the Atlantic World. 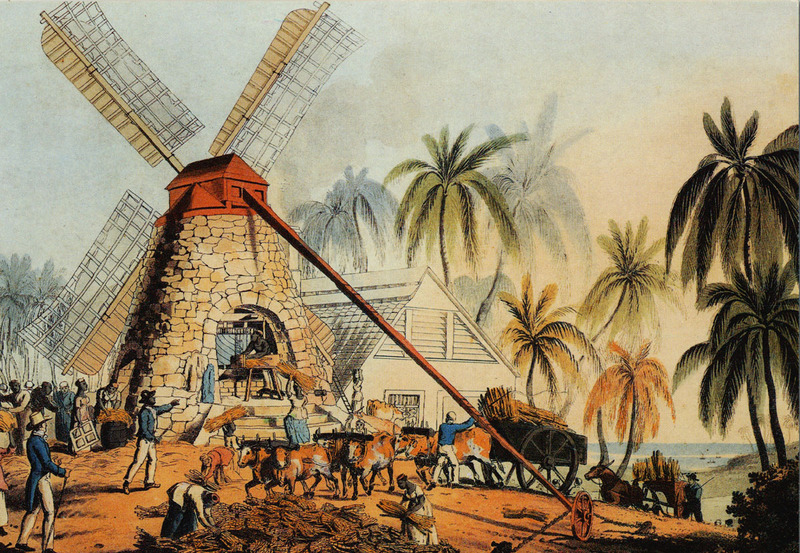 Sugar processing on the English colony of Antigua, drawing by William Clark, 1823, courtesy of the John Carter Brown Library at Brown University. From African Atlantic islands, sugar plantations quickly spread to tropical Caribbean islands with European expansion into the New World. European maritime expansion across the Atlantic Ocean first began with Norse voyages to Iceland and Greenland in the ninth and tenth centuries. But the first European establishment of long distance maritime trade and settlement in the Atlantic World began in the fourteenth century, when explorers from Mediterranean and Atlantic European countries began trading with islanders off the western coast of Africa (such as the Canary, Cape Verde, Madeira, and Azores islands). Eventually western European entrepreneurs and settlers followed Atlantic explorers to these islands to establish early sugar plantations and trading outposts. As sugar plantations grew to require significant numbers of workers and strenuous levels of labor, Europeans enslaved islanders or imported enslaved Africans acquired through trade with the nearby West and Central African coast. In this way, African Atlantic islands became home to some of the earliest examples of the plantation agricultural complex and enslaved African labor system that would come to dominate the Atlantic World. These plantations developed from Mediterranean farming systems that focused on growing cash crops for trade rather than on subsistence crops for local use. Europeans first encountered many of their major cash crops, such as sugar, through exposure to Muslim agriculture during the Crusades (from the eleventh to thirteenth centuries). Sugarcane particularly appealed to Europeans because their only sweetener before that time had been honey. They could also use sugar to make alcoholic beverages, such as rum or Madeira. But growing sugarcane required access to tropical lands not found in northern Europe, and processing and transporting sugar throughout Europe required significant labor and trading resources. Sugar also did not have the nutritional value to be a staple crop for local consumers, like wheat or rice. Instead it was a supplemental, luxury good that had to be grown for a widespread consumer base to become a profitable cash crop. This launched a demand for long-distance trade networks, as well as significant labor and land resources. For these reasons, the expanding European sugar market particularly fueled the rise of plantation-style agriculture, cash crop trading, and plantation slavery throughout the Atlantic World. Loading sugar and molasses for shipping to England from Barbados, ca. 18th century, courtesy of the Barbados Museum and Historical Society. 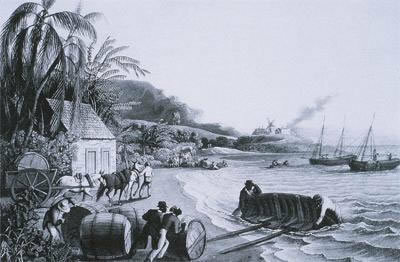 Sugar required extensive maritime trade networks to become a lucrative cash crop. 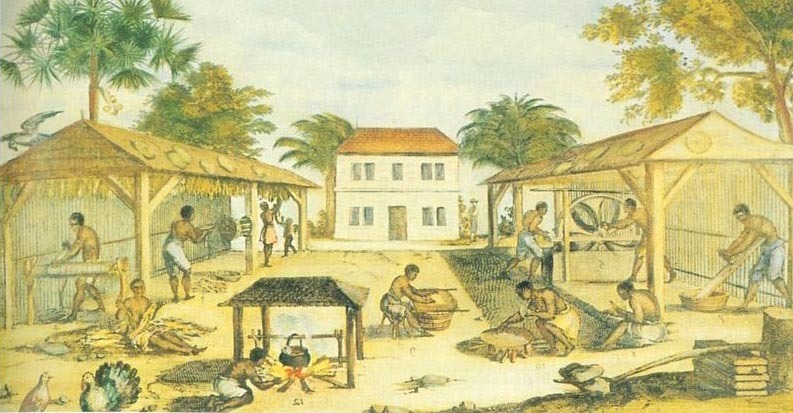 When Europeans settled areas in the Americas where sugarcane could not grow, or when they had to adjust to a competitive sugar market, they found that they could adapt the plantation model and coerced labor structure to capitalize on other cash crops that also had a large consumer market appeal, such as tobacco, indigo, rice, and eventually cotton. Considering the close proximity of Africa, why did Europeans not colonize and establish plantations on the nearby West and Central African mainland, rather than spending valuable resources to cross the Atlantic Ocean to the Americas? Ultimately most Central and Western African nations and empires were militarily too strong for extensive European occupation. Leaders of these African regions often proved willing to trade goods and enslaved Africans, and they even established military alliances with Europeans in outpost settlements, but they resisted and generally prevented widespread European colonization during the early stages of New World expansion. In addition, Europeans lacked immunities to many tropical diseases, which encouraged them to settle on islands or the coast rather than in the African interior. The strength of the Ottoman Empire blocked European expansion east of the Mediterranean, which also forced Europeans in the fifteenth and sixteenth centuries to look west for commercial growth and colonization. Driven by profit-seeking, labor intensive ventures such as plantations and mines, Europeans transformed the Atlantic Ocean from a barrier into highways for transporting goods, settlers, and coerced laborers. Plantation agriculture and cash crop trading played a central role in fueling European expansion into the New World, and in developing chattel slavery, primarily of Africans, in the Americas. Slaves working on a tobacco plantation in seventeenth century Virginia, 1670. In areas where sugar was not a cash crop, European settlers used the plantation and slave labor model to cultivate other cash crops, such as tobacco.